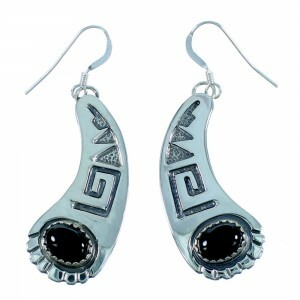 Sterling silver and real Onyx. 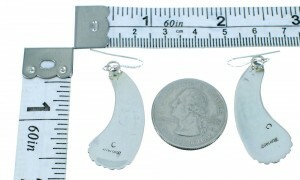 Hook dangle earrings measure approximately 2" long (including hook) and 1/2" at widest point. This is a wonderful piece of Navajo artistry! 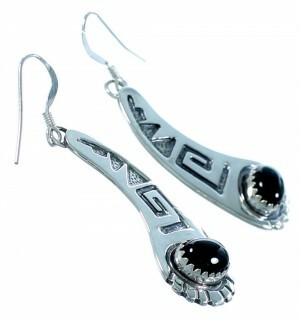 This piece of Native American jewelry is Navajo hand crafted by artist Charlie Yazzie, out of genuine sterling silver and real Onyx stones. The earrings have a total of TWO stones (ONE in each earring) that are delicately placed in hand cut bezel settings, while imprinted patterns and hand cut Water Wave designs highlight for a fabulous finish. In Native American beliefs, the water waves design represents continuous life. Earrings are stamped sterling and hallmarked.